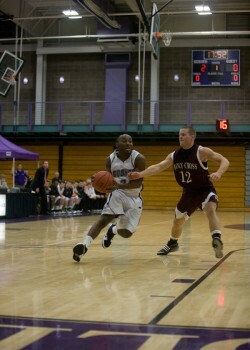 Daniel Butler jukes around an opponent in the Leafs' recent contest against Holy Cross. Photo provided by Sports Information Department. Their first opponent on Friday was Walsh College who is nationally ranked. The Goshen team was able to shock the #7 team in the nation, Grand View, this past weekend, as they looked to do the same to Walsh. The game was close throughout the night with 11 lead changes and score tied 10 times. Both teams were evenly matched but Walsh College was able to dominate in the paint scoring 34 points to Goshen’s 18, although Goshen was able to take advantage off turnovers more effectively scoring 31 point due to turnovers compared to Walsh’s 23. At the end of the first period Goshen was trailing by 6 points. In the second period of the game Goshen got back in the game forcing Walsh College in to two overtime periods. During the second overtime Goshen’s top scorer, Senior Errick McCollum fouled out as Goshen lost 100 to 105. After nearly upsetting Walsh College the men’s team followed up their Friday night performance Saturday evening playing against Malone University and pulling out a win from behind 72-70. At the end of the first period Goshen found themselves trailing to Malone 36-27. When the leafs came out of the locker room they were able to find some energy to go on two streaks going 7-0 to get back within 11 points and 17-2 to take their first lead of the period and never looked back. Errick McCollum and Daniel Butler led the teams with 21 and 20 points respectively. This win puts the Leafs back on the winning side with a 3-2 record. The Leafs will look to add to their win Column as they play Hanover and Denison College in the Sodexo Classic at Hanover. Friday November 21 they face off Hanover at 7:30pm and Saturday November 22, they play Denison at 3pm.